Home » Blog » The Easter Black Pudding – Don’t miss out! 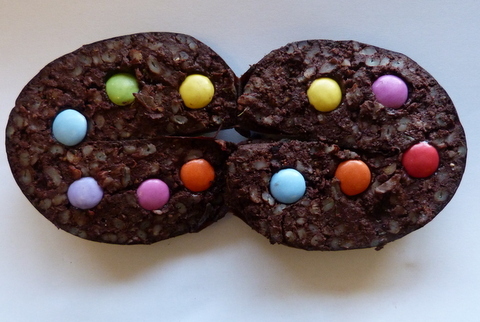 The Easter Black Pudding – Don’t miss out! Fresh from their success of winning 3 Gold Medals in the Best Black Pudding in Great Britain Competition, The Real Lancashire Black Pudding Company have come up with yet another ground breaking product. The most highly decorated black pudding makers in Great Britain have already introduced the Chilli Black Pudding and the revolutionary Vegetarian Black Pudding, the latest creation from the Rossendale based company is ‘The Easter Black Pudding.’ This is a traditional Bury Black Pudding but rather than adding cubes of fat as normal they have replaced them with smarties (popular coloured chocolate beans). The new Easter Puddings have met with rave reviews. It has been added to the menu of one of Lancashire’s finest restaurants and is flying off the shelves at the supermarkets. Demand is so high that the Real Lancashire Black Pudding Company has had to put an extra shift on to cope with increased production, with one member of staff permanently opening the tubes of smarties. We are already working on a Christmas Black Pudding, but we are struggling to find a supplier of edible sixpences.